Removing ceramic floor tiles is a dusty, dirty job, and certainly not easy if you're planning on saving the tiles for use later on. 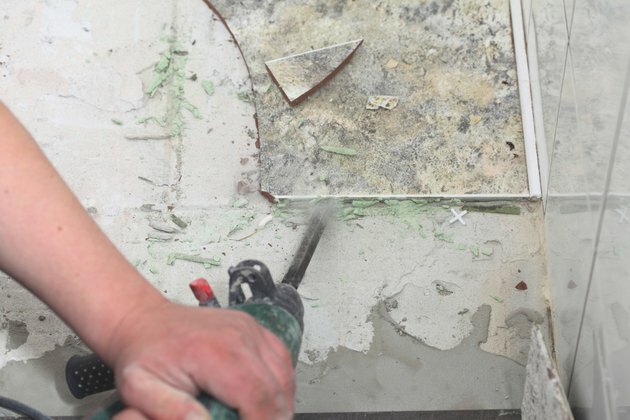 For a complete demolition, you can use tools to make your job easier -- but you need determination and patience if you intend to remove all or most of the tiles in one piece. You may want to ask a friend for help. 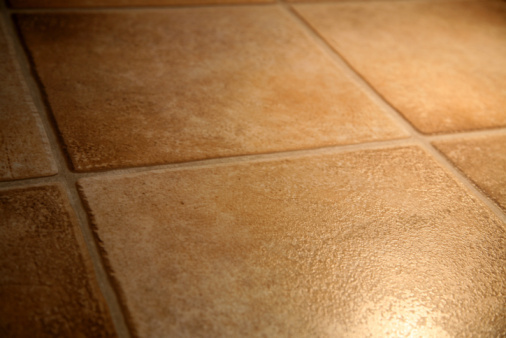 Cover everything else in the room with plastic before removing your floor tile. This includes cabinets, countertops, doorways, light fixtures and windows. Remove all wall hangings and window treatments. Close heat and air vents to prevent dust from traveling through your duct work into the rest of your house. Put on gloves, safety glasses and a dust mask. Place an old towel over a small section of tile and use the sledgehammer to bust up the tile. Clean out the broken tile; use the power scraper to continue breaking the tile out and scraping the adhesive off the subfloor. A power scraper has a paddle-shaped bit and moves back and forth to essentially break and scrape the tile and adhesive at the same time. Power scrapers can be rented by the day at some hardware stores and tool rental stores. Scoop the busted tiles -- in small amounts -- into heavy duty trash bags. Broken tiles are still heavy, so don't overfill the bag or it may break. Insert the fine-particle filter into your shop vac. The filter will stop the dust from being released back into the air. Removing floor tiles without breaking them is not an easy task, and there's no guarantee that you won't break some of them. Begin by covering everything with plastic, and put on your safety gear. Use the 4-inch grinder and diamond carbide blade to cut all of the grout lines. Ask a helper to hold the hose of the shop vac close to the grinder. The shop vac helps prevent a massive cloud of dust from forming while you're cutting the grout lines. Sacrifice at least one tile by breaking it with the sledgehammer -- this gives you a place to start removing the remaining tiles with a 6-inch putty knife and hammer. Place the blade of the putty knife at the base of a tile, and hold it as close to the floor as possible. Begin lightly hitting the handle of the putty knife with your hammer until the blade begins sliding under the tile. Work across the width of the tile and around it until the tile pops loose. Continue this process until you have removed all the tiles. Concrete board is used for tile installations over plywood subfloors. After you remove the tile, it's next to impossible to locate all the screws holding the concrete board in place. You can use a circular saw to cut the concrete board and pry it up without cutting through your subfloor. Install the concrete blade on your circular saw. Wood blades are not designed to cut through concrete board. Set the blade to cut to a depth of 1/4 inch. This is the thickness of most concrete board used for tile installations. Put on your safety glasses and dust mask. Cutting out concrete board will also create a large amount of dust. Cut across the floor in 3-foot-wide sections in both directions. Cutting both ways creates smaller sections that are easier to pry out. Use your pry bar and hammer to remove the sections of concrete board. Poured thin-set is used to set tile on concrete floors. A layer is left behind on your concrete subfloor when you remove tiles. The easiest method of removal is to use a power floor scraper. It will push the thin-set off just as it pushes off ceramic tile. It's a time-consuming and dusty job. Wear a dust mask and safety glasses. Ventilate the room if possible, and cover everything with plastic. Tile floors in older homes may have a concrete bed and mesh wire the tiles were set in, mainly in bathrooms. The small tiles are almost impossible to break, and just as hard to get out. Mesh wire was used over the wood subfloor to provide strength, and a surface for the concrete to bond to. The mesh wire will become exposed as you remove sections of tile and concrete. Put on a long-sleeve shirt, safety glasses and leather gloves before attempting to remove it. Mesh wire is extremely sharp and can cut you. Use the 4-inch grinder to cut the edges of mesh wire closest to the tile that's still adhered to the floor. Use tin snips to cut in areas where you can't use the grinder. Slide the pry bar under the mesh to remove it from the subfloor. The mesh has been tacked or stapled in place. Repeat this process as you work across the floor.